Eat your heart out, pointlessly thin people, for this is a photo of the birthday cake Bob made for me yesterday. 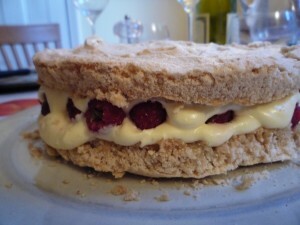 Two layers of chewy hazelnut meringue filled with double cream and fresh raspberries. A thing of beauty and a joy forever! This entry was posted on Wednesday 27th May 2009 at 8:20pm	and is filed under Daily Life, Inspirations. You can leave a response, or trackback from your own site.